next set of 10 week classes that begin April 23rd 2019! Join us, we’d love to have you in class! Absolute Beginner class registration is now open! Full On-line registration for classes will open on: Sunday March 31st at 10am! Please subscribe to our email list to hear about priority registration and Uke Events! Simply click on the links, or scroll down to easily get Uke’n! The Ruby’s Ukes Ukulele Courses Extraordinare below are 10 week foundation ukulele courses that focus on specific playing levels and learning outcomes, and leave you smiling and a whole lot smarter! From absolute novice to advanced player, these courses are designed to be repeated till you comfortably get to your own personal ‘next level’. Simply read ‘what level am I?’ to easily choose which course is perfect for you! click here to see all the courses on offer you have 12 to choose from! The Ruby’s Ukes Specialist Ukulele Workshops below are individual, two hour workshops that focus on Specialist Ukulele Subjects, and leave you smiling and a whole lot smarter! Ukuleles will be available to borrow (Free) during class time at Ruby’s Ukes School, please register to reserve a Soprano ukulele. Or for sale (prices range from $45 – $235) as well as Ukulele tuners, bags, & hand-made custom straps! Ruby’s Ukes presents Ukulele Courses Extraordinaire learning a swing, jazz, blues, & folk repertoire. Classes are 90-minute sessions and will leave you smiling and a whole lot smarter! Courses run for 10 consecutive weeks. This fun class has on average 28-30 students, big enough for great atmosphere, a fun time learning, making new friends, (and hiding in the back if you want to! ), small enough to receive what is being taught and integrating it. 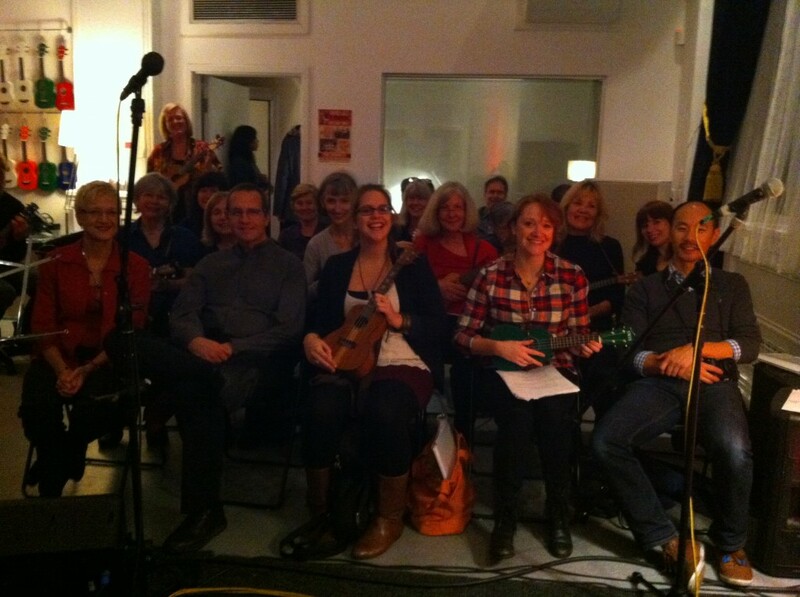 Classes are held at the Ruby’s Ukes Ukulele School, 525 Seymour Street and now we have added satellite classes over in North Vancouver at Presentation House. Ruby’s Ukes Ukulele Courses run September, January, & April every year! We also present Ukulele Workshops throughout the semester these are two hour sessions focusing on particular topics: such as Strumming, Melody playing, The Blues, Singing, and Clawhammer Ukulele and more! We are constantly adding NEW classes so keep checking back or sign up to our email list by using the subscribe button.